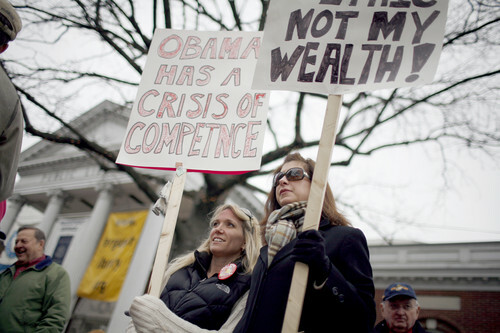 From Tea Party protests in Hartford, Connecticut. See Also: Tax Freedom Day: 8 days Earlier Than In 2008, The Highjacking Of The Tea Parties, Fox News’ Promotion Of Tea Parties Shatters Their Credibility, Spring fever, Gallup Poll Apparently Says Us Teabaggers Are Out Of Touch (? ), Tea Parties and the “Fringe” Who Are Not Welcome, There Is Reason To Fear The Tea Party Movement, Are the tea parties “a sham and a fraud”?, MSNBC devotes 13 minutes to “teabagging” puns, The Looney Right & The Tea Parties, Addressing some Tea Party concerns, Time to Party Tomorrow, St. Louis News Links Tea Party Protesters to “Extremist” Group, Correctly Political: Tea and Sympathy for the Devil You Know, and Played for Fools. Uh … There is no ‘Fail’ here, except identifying this as a ‘Fail’. The sign says exactly what is intended. The carrier is using a homonym (or nearly so), ‘competence’, to play on the word ‘confidence’. The intent is to convey her skepticism of Obama’s competence. Sorry, but you Fail. But I’d bet *that* won’t be submitted to Reddit. … And now the misspelling of ‘misspell’. I must be having a bad day. It’s ok, you’re probably the only one here. Wait, did I use “it’s” properly? It’s = it is. Whew, ok. Wait, did I use you’re correctly? Good. And can we please stop calling things “fail” or using “ftw”? I know quite a few folks who voted for Obama as Dem’s and as independents that are going and supporting the tea parties. Most of us going are ticked off at _all parties_ involved in handing out our hard earned tax dollars to corporations rather than their intended purpose of supporting our government. She’s pretty and blonde. And she couldn’t fit all those letters on one line, so cut her some slack, okay? Why can’t conservatives learn how to spell and punctuate? Might it be a crisis of intelligence? skipping letters on a protest sign is fine. Its better than not protesting at all and just slacking surfing the internets or watching TV. I had a tea party with your mom last night and she loved it. All 8 of you commentators. These “tea parties” showed us the dumb side of America. They were full of gulible idiots who believe every lie they hear on Fox News and every scrap of misinformation that is spewed by the GOP. The Republican party truly is in shambles now. Their “base” is now a bunch of uneducated morons and/or religious extremists. Good riddance. Completely agree with Annie. Is Obama a fascist a socialist? Republicans can’t make up their minds. Or perhaps (and more likely) they do not know the meaning of either word. THE DUFACE BELOW DOESN’T SEE THE SPELLING MISTAKE! LOL! WHAT A TEA BAGGER! What Does “Too Big To Fail” Mean?